Arden International’s Jack Aitken led the way in Free Practice today at the Hockenheimring. The Renault Academy driver’s best laptime of 1:28.955 was one tenth faster than ART Grand Prix’s and Scuderia Ferrari Team development driver Charles Leclerc. 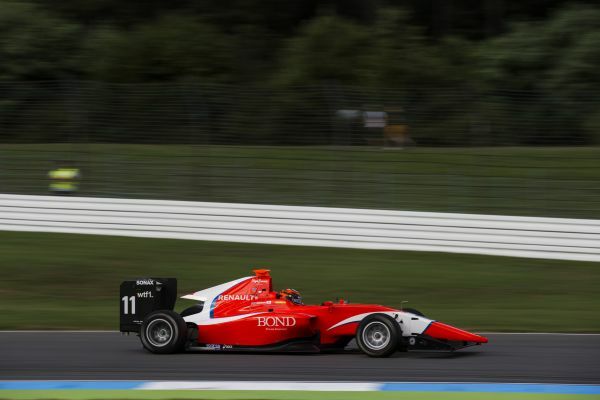 Trident’s and Ferrari Driver Academy’s Antonio Fuoco was third. There was one change to the driver line-up compared to Round 4 last week with no Richard Gonda at Jenzer Motorsport. Despite the threat of the rain, practice was run in warm temperatures with Leclerc first to set the early pace. Fresh from his appearance in FP1 for the Haas F1 Team, the Monegasque driver held a one tenth advantage over Jake Dennis. Aitken had a small excursion at Turn 12 as he found the limits of the Hockenheimring but it was clear he had good pace in his Arden machine as he lapped third fastest in the first quarter of the session. DAMS’ and Haas F1 Team development driver Santino Ferrucci lit up the timing screens when he went P1 and was first to dip under the 1m30’s bracket. That was until Leclerc clocked a flier to shoot to the head of the timesheet by over half a second. Series leader Alexander Albon was hot on his teammate’s tail and posted a lap one tenth shy of his title rival, as ART Grand Prix held the top four positions briefly with Nirei Fukuzumi and Nyck de Vries completing the quartet. The drivers also took the opportunity to practice race starts during the session. Trident’s Giuliano Alesi shot to second position in the latter stages; a mere 0.060’s adrift off Leclerc’s best effort. The Ferrari Driver Academy driver had recorded the best time in the middle sector. But Aitken had more in his pocket as he rose to P1 and held on until the chequered flag. Leclerc improved to second, whilst Fuoco demoted his teammate Alesi to fourth. The session was red flagged in the final minute when Campos Racing’s Steijn Schothorst stopped on circuit. Behind the top four at the end of the session were: Ferrucci, Schothorst, Jake Hughes, Albon, Dennis and De Vries. Tomorrow’s qualifying session will commence at 09.45 local time (GMT+2).